The new Charge protoype frames have arrived at the Fixed Gear London HQ and I can’t wait to go over there and check them out. At the moment, only Ted and Tom are getting them as there are only three in existence and the guys at Charge need to keep one. Dammit! I’m gonna try Ted’s and hope that I don’t like it I guess! 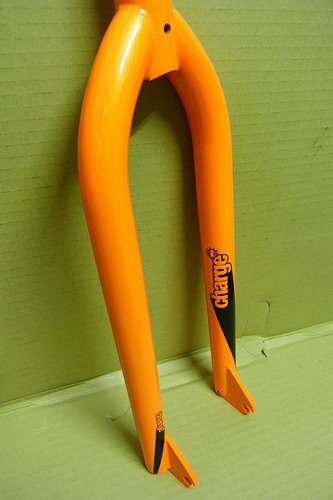 Here’s a pic of the new fork. I’m pretty keen on getting this as soon as possible as I’m struggling with the weight of the Nozzle forks that I just put on. Are you really struggling with the weight of a fork? No, the new fork is much lighter than the old one!